It all works out well in the end, leading to an adjustment in Eden's life. Instead of living in the lamp, she'll live in New York, with a lovely ex-genie. And this is where Eden's Escape (Disney-Hyperion, Sept. 6) begins, with a whirlwind tour of New York as seen through the eyes of a sheltered genie. But Eden can't enjoy her new life for long. She's kidnapped by a powerful and eccentric tech genius millionaire, who, like the bad guys in book 1, wants to use her and the lamp for his own purposes. She escapes the lab where she taken, and finds that she's in Paris, with no money, passport, cell phone...or magical lamp. 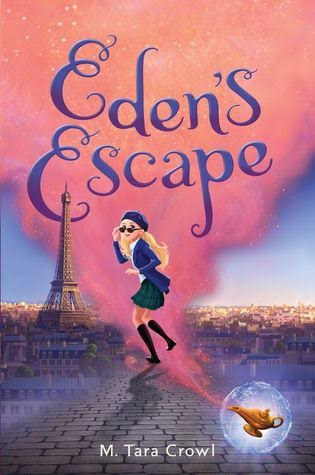 Once again a local girl (a rebellious fashionista) looks after her...but to add to her problems, the same bad genie cabal find she's in Paris, and they plot to capture her themselves. The momentum builds and builds as old enemies must work together to save the lamp, and it becomes a true page turner! Although much is made of how beautiful the genies are (and there is diversity among them, which is good, though their names were not all historically accurate, which grated on my pedantic little eyes*), they are also formidably intelligent, and although Eden hasn't had enough real world experience to be a true Nancy Drew type character, she's smart enough to listen and pay attention and use what she's learned to good effect. And to use oxygen tanks to good effect to, during her escape from the Paris lab. What makes her most likeable is the wonder and joy she takes in the world and all that we take for granted--seeing San Diego, New York, and Paris through her fresh eyes is a treat! These are great books for a ten or eleven year old--the dangers are vivid and gripping, the young characters relatable and interesting, and the various permutations of genie magic add enchantment. 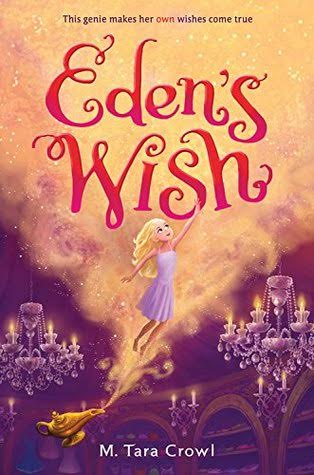 Older, more cynical, readers might not be able to swallow the lucky chances that make Eden's path easier than it might have been, but younger ones will be happy to go along with the ride. *I just can't believe a Bambi from the 19th century. Unless it's a male deer.